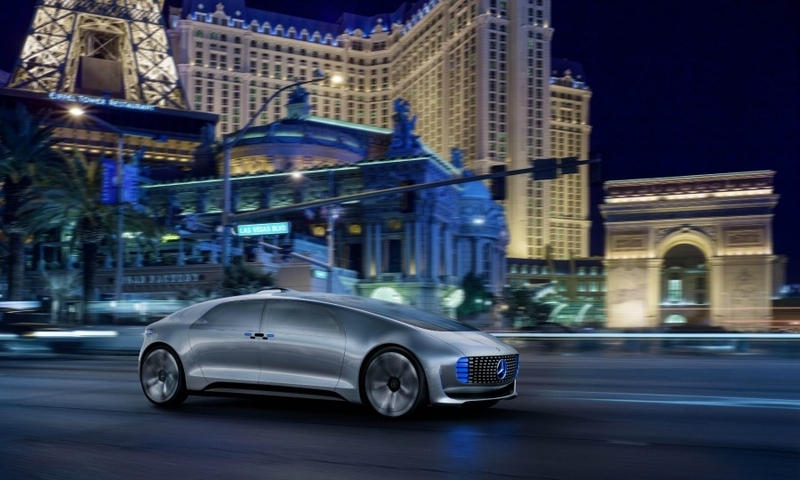 LAS VEGAS -- Never before has living in your car been made to sound so glamorous. 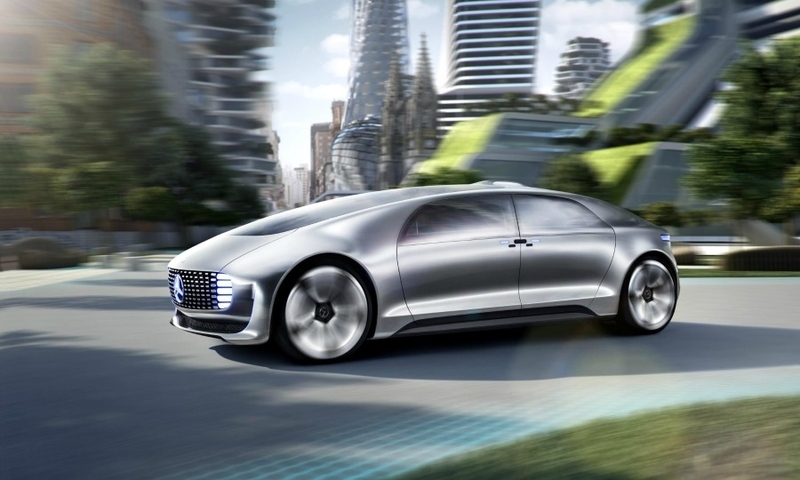 Mercedes-Benz unveiled a concept car that illustrates its vision of luxury circa 2030, when self-driving vehicles would be sophisticated enough for drivers to be able to hand over control to a network of computer chips and sensors, and use their onboard time for work, play or rest. 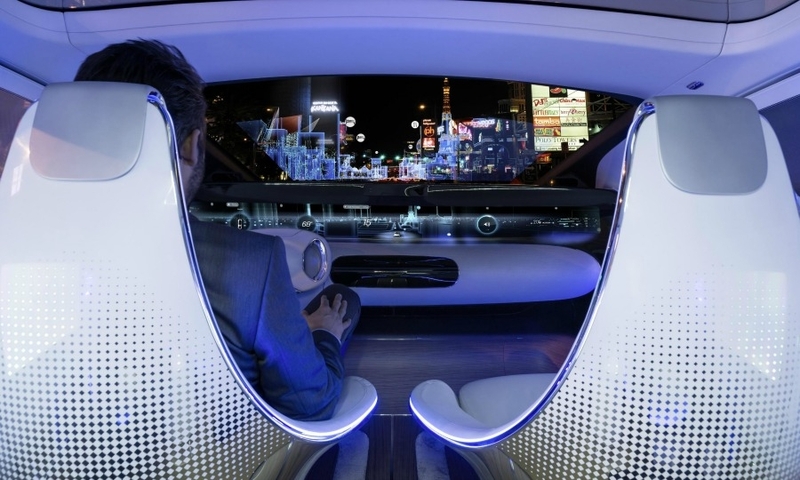 The four seats in Mercedes’ concept car, including the “driver” seat, rotate inward, allowing travelers to have a face-to-face conversation in a loungelike setting. 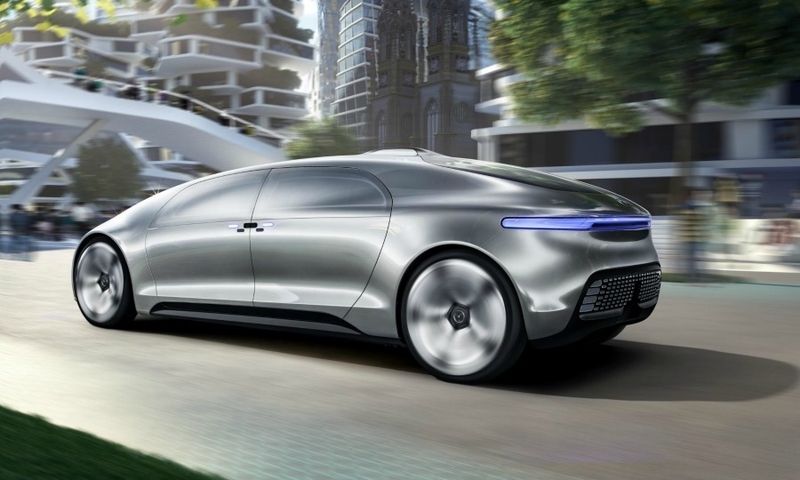 The design reflects what Mercedes believes customers will want from luxury cars within a few decades: a private, comfortable retreat in the crowded megacities of the future. 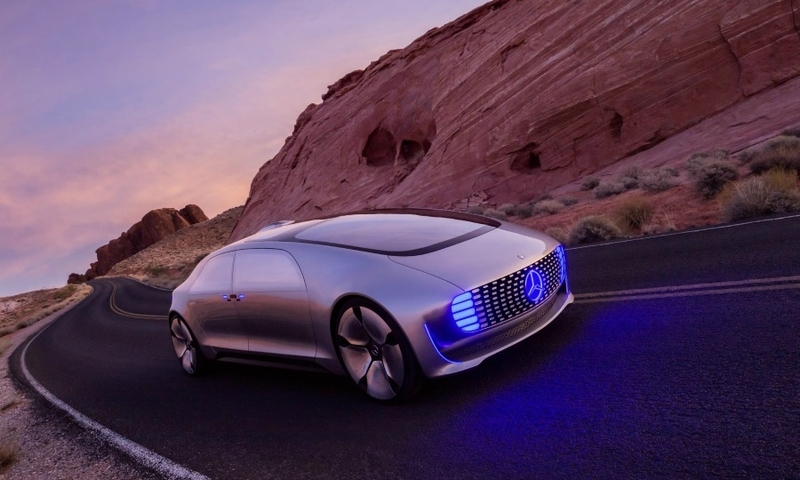 “The car is growing beyond its role as a mere means of transport and will ultimately become a mobile living space,” Daimler CEO Dieter Zetsche, said here on Monday night. 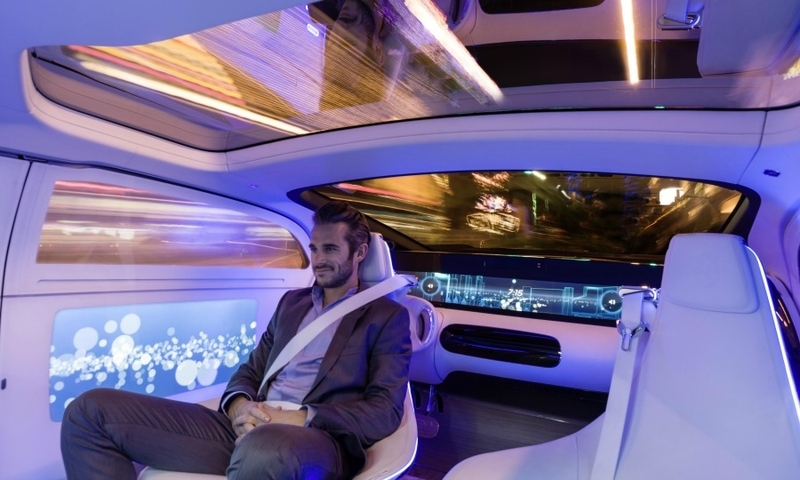 That’s a far different vision from the podlike prototype unveiled in May by Google Inc., which sees its autonomous driving technology not as a luxury platform but as the basis of a point-to-point, on-demand public transit system. Yet each of these companies is helping to accelerate the effort to bring self-driving vehicles to market. Google not only has been testing a fleet of self-driving Lexus RX 450h hybrids around its Silicon Valley neighborhood, but has used its mapping expertise to refine guidance systems for autonomous vehicles. 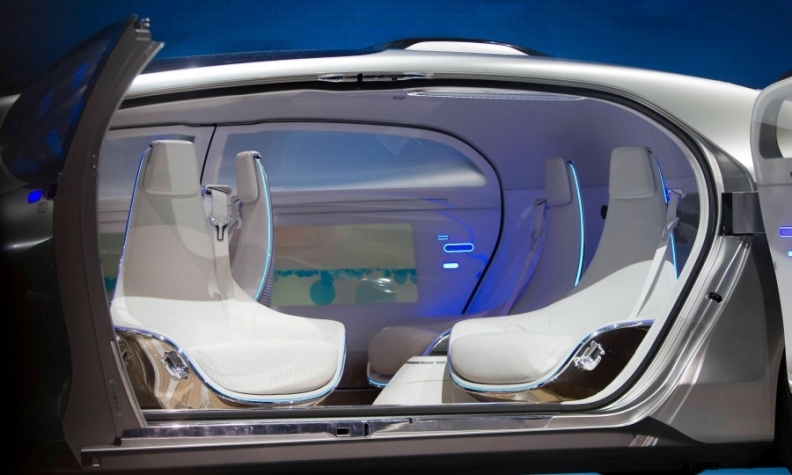 Mercedes, which offers technology in its S-class flagship sedan that allows the car to largely drive itself in a traffic jam or on the highway, has built one of the auto industry’s most ambitious research programs in autonomous vehicles. In August 2013, a modified S class drove a 100km route, roughly 60 miles, from Mannheim to Pforzheim, Germany, without human intervention, retracing the path that Bertha Benz took in 1888 to show husband Karl Benz that the motor car he invented was a viable mode of transportation. 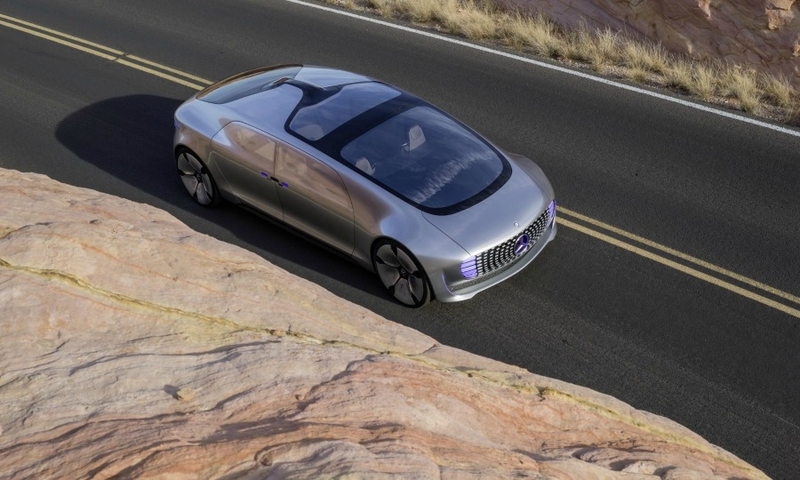 Mercedes also has tested vehicles at its r&d center in Silicon Valley. In autumn 2014, it became one of the first automakers to get a license from California to test self-driving vehicles on public roads, and announced plans to test its cars at a decommissioned naval base east of San Francisco. 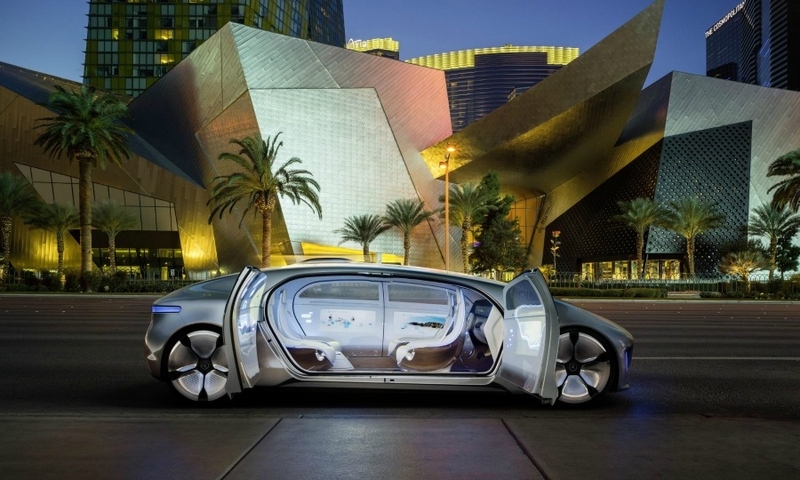 The new concept, called “Luxury in Motion,” takes a longer leap into the future. The car is powered by a plug-in hybrid powertrain that pairs batteries with a hydrogen fuel cell for a peak output of 272 hp. 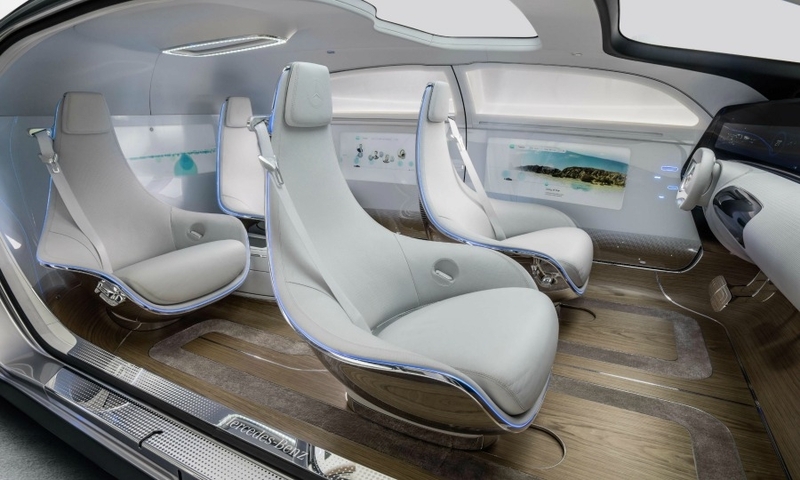 The four seats in Daimler's Luxury in Motion concept car rotate inward, allowing travelers to have a face-to-face conversation in a loungelike setting. Inside, the rotating seats twist outward once the doors are opened, so it’s easier to step out of the vehicle. 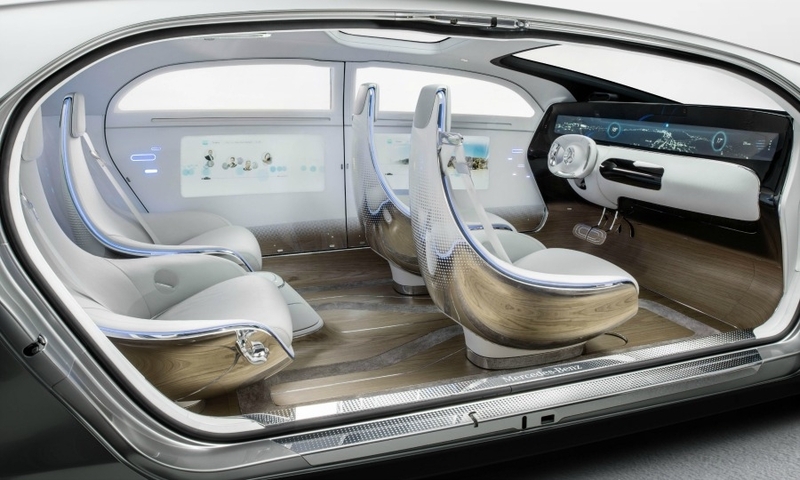 The front seats rotate into a traditional, forward-facing orientation if the driver wants to take the wheel, at which point the steering wheel automatically extends out of the dashboard. 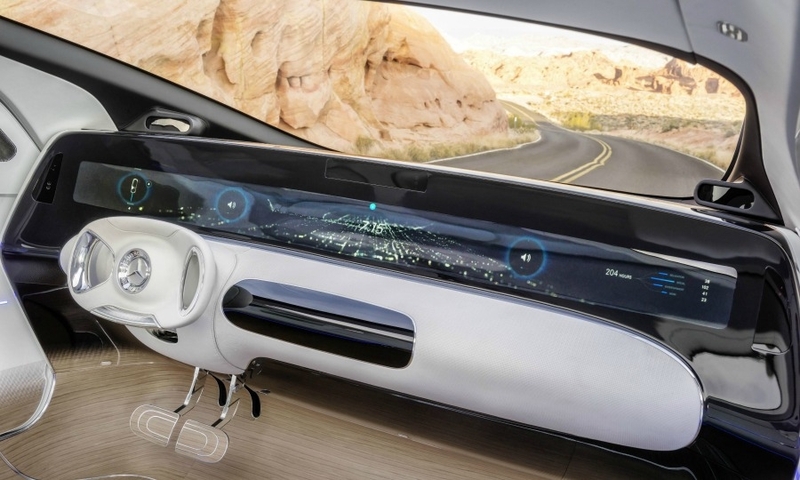 There are six display screens in the instrument panel and the rear and side panels, which can be controlled by gestures, eye-tracking or touch. The exterior features a low-slung roofline that flows in one curved line from fender to fender. The body is made of carbon-fiber-reinforced plastic, aluminum and high-strength steel, making it 40 percent lighter than today’s production cars. It has suicide doors that open to 90 degrees for easy entry. 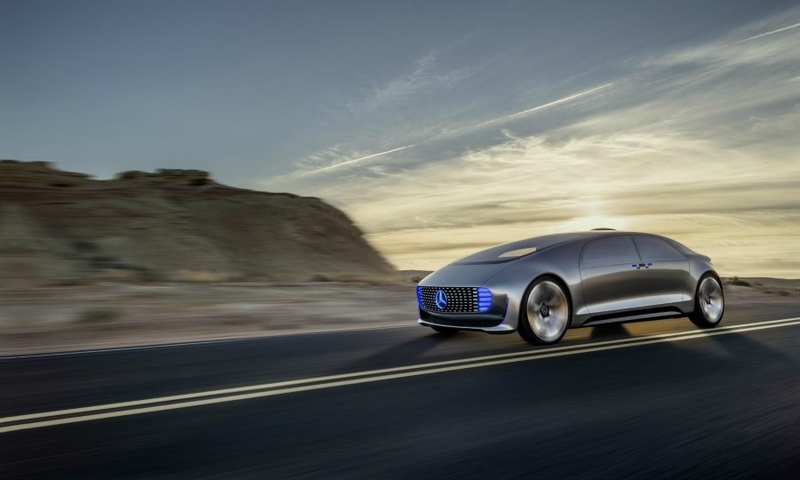 Mercedes says the body structure could withstand a side-impact crash because of a mechanical system that locks the side doors against one another, as well as to the roof frame and side skirts. In place of headlights and taillights, the car has color-changing LED light modules that glow blue if the car is driving itself and white if the driver is in control.